The popular outpouring in France, taken with the climate marches in September with which it would not at first be bracketed, may be a harbinger of change. 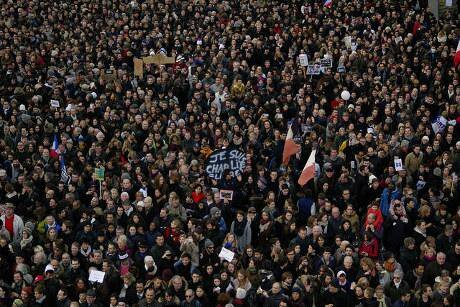 The wisdom of crowds—massing for freedom in Paris. Flickr / Antoine Walter. Some rights reserved. These are, it goes without saying, troubling times. A generation across much of the globe has known nothing other than growing insecurity, rising inequality and a declining sense of collective political efficacy—the very goals of the neoliberal True Believers who sought to replace post-war democratic governance and the production of public goods by restoration to untrammelled power of the owners of capital, masquerading as anonymous and unchallengeable ‘market forces’. Equally dispiritingly, since advanced capitalism easily saw off a backward socialism as the USSR collapsed, the alternative pole of opposition has fallen by default in many places—particularly where that failure was compounded by disillusionment with the secular Arab nationalism which the Soviets supported during the cold war—to the even more backward forces of authoritarian Islamism. But there is a stirring. While these are early days, two unprecedented episodes in recent months have been suggestive of a swing in the political pendulum back in the progressive direction for the first time since the late 1960s. True, there have been false dawns. The ‘anti-globalisation’ movement which peaked with the ‘battle in Seattle’ at the World Trade Organisation meeting in 1999 was one, the more recent ‘Occupy’ movement another. Both ephemera shared too much the fundamental characteristic identified by the great, late Fred Halliday of the six major 20th-century revolutions—a negative, ‘stop the world, we want to get off’ oppositionalism which defied the original, Marxian understanding of revolution as a radical emancipation going with the grain of social change. But the ‘people’s climate marches’ across the world in September, coinciding with the United Nations summit on climate change, represented an historic first in the global co-ordination of political protest: the organisers claimed 2.642 events took place in 162 countries, with 400,000 marching in New York alone, to assert the claim of popular sovereignty to save the planet over the rapaciousness of corporate capitalism. And the vast demonstrations in France today in defence of liberty against the Islamist assassins of the Charlie Hebdo cartoonists, with officially 3.7m taking part, were the largest in its history—and, surely, in almost any state—as #JeSuisCharlie became one of the most popular hashtags ever. And it’s a safe bet that many of those who joined the climate marches would have marched for Charlie Hebdo too. Many on the other side would, meanwhile, have been equally bewildered by these public outpourings—from the Masters of the Universe still hoping that the (second) Wall Street crash would not disrupt ‘business as usual’ to the discomfited Front National leaders, missing from the manif, no doubt initially rubbing their hands in glee at the prospect of cashing in on last week’s atrocity. Belief in progress remains, as always, a fragile wager. Can the hope of solidarity among strangers outweigh the fear of the ‘other’, particularly in a stretched social hierarchy? The internet is awash with misanthropic messaging, even hate speech, and yet New York in September and Paris today were unthinkable without it. And this for a critical reason. It is to provide no apologia for the ‘revolutionism’ of the last century, which only saw in new, authoritarian Leviathans, to say that Lenin’s ‘withering away of the state’ was quite simply a utopian project in the context of the ‘co-ordination dilemmas’ of the world before the internet. No more than the Large Hadron Collider was the ‘regulated society’ which Gramsci envisaged, as the absorption of the state into civil society, conceivable before the emergence of the online public square, through which civil society could become fully self-organising, in a networked rather than hierarchical fashion. That this is not a utopian scheme is evident in another marked commonality between the two sets of demonstrations. The UN secretary general, Ban Ki-moon, stepped down from his New York headquarters to lead the marchers in the street. And the French president, François Holland, was joined by some 40 world leaders at the van in Paris. Many, of course, pointed to the contradictions: Ban had hardly been an ecological activist hitherto and, even more gratingly, today figures from markedly authoritarian states seemed happy to defend freedom of expression … just as long as it was somewhere else. But this is to miss the point: in a world where what Gramsci called ‘civil society’ and ‘political society’ have been diverging as inequality has yawned and in which, to him, the progressive task is as always to break down the division between rulers and ruled, the fact that the rulers are seeing the way the ruled are going and are determined not to get on the wrong side of history is surely telling. And the critical point is this: there is no more secure place, no place which feels more equal, no place above all where citizens can experience more collective efficacy than in a crowd—whose wisdom can now be captured on a global scale. It is in that public square that we can recognise our common humanity. It is there that we can even take into consideration the humanity of the generations who will succeed us as custodians of this vulnerable ecosystem. And it is there that, yes, today, in our millions, nous étions tous Charlie Hebdo.